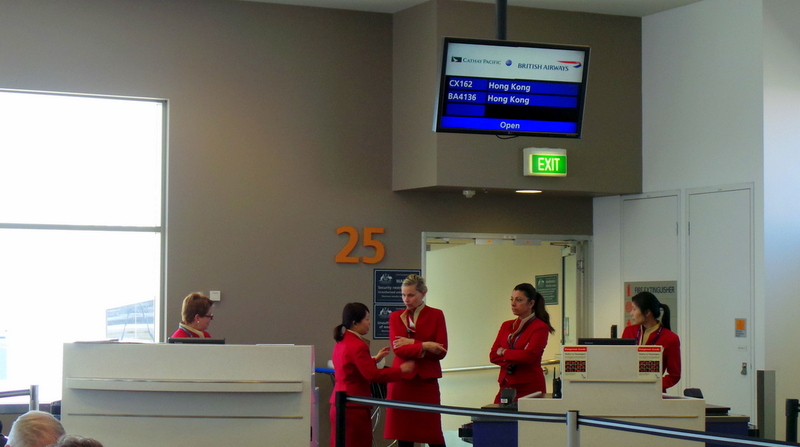 Cathay Pacific’s check-in desks at Sydney Airport is located in section A. Meaning it’s on the far end to the left. It also means that it’s quietly tucked away from the usual hustle and chaos one would associate with Sydney Airport departures during ‘rush hour’. So when I checked in at around 0830AM, I felt cocooned in the quiet check-in area. Despite there being a group of tourists , the check-in process was quiet and quick. There were balloons behind every check-in desk. “Celebrating 40 Years of Service in Sydney”, with Cathay Pacific’s logo stamped in the balloons, which were in the unmistakable shade of Cathay Pacific green. 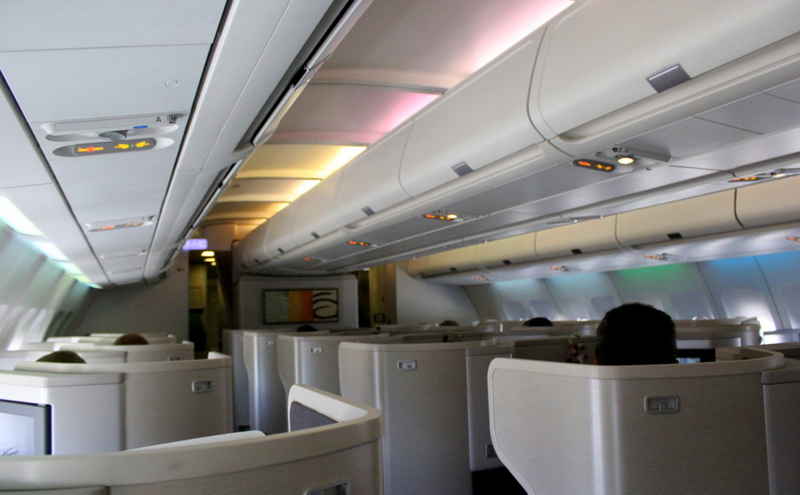 There are 10 rows in business class in a 1 – 2 -1 configuration. Privacy is ensured with high shell back seats, and unless you are as tall as that man in front, you really won’t see the heads of passengers in front. All passengers also have access to aisle, and the 2 seats in the middle are great for couples travelling. For solo travellers who find themselves in the middle seat, the angled distance between the headrests and the privacy division between seats won’t ever provide an awkward seat-mate situation. The seat is very extremely comfortable even on its upright position. The seat foams are thick and firm, which is also my choice for beds so it worked really well on all seat positions. 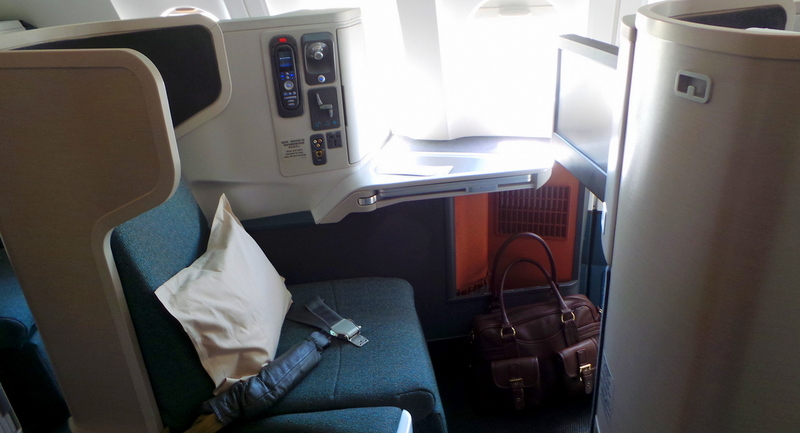 I learned that when Cathay Pacific refurbished their business class seats, they ran a survey among their Marco Polo club members who gave recommendations on what they wanted in a business class seat whether they are watching in-flight movies, eating, doing work, and most of all sleeping. 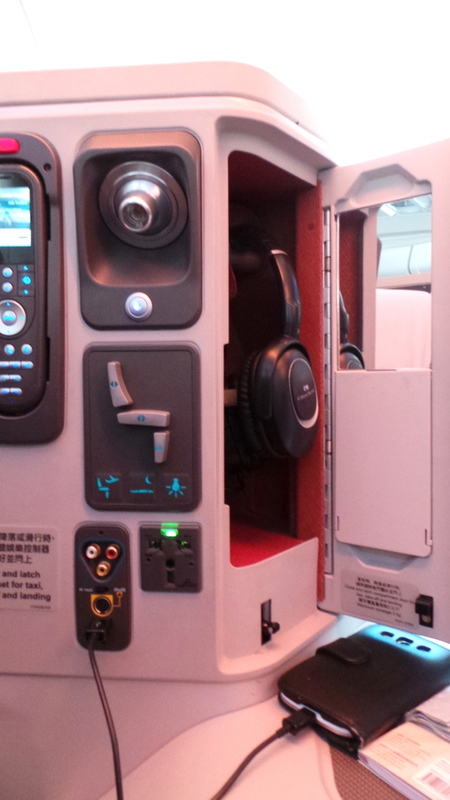 The seat control panel is where you can find it all – chargers, entertainment control, seat recline controller and the headphones compartment, which I found was a perfect storage for point and shoot digicams – just don’t forget about it later! The mirror inside the cover flap also helps! On it’s fully flat position, the seat runs over 2 metres long (82 inches). The bed width is 23.5 inches across. It’s quite comfortable, and as with all lie-flat seats, I suggest leaving at least a 10 -20 degree incline because a fully flat aircraft bed will hurt your back. 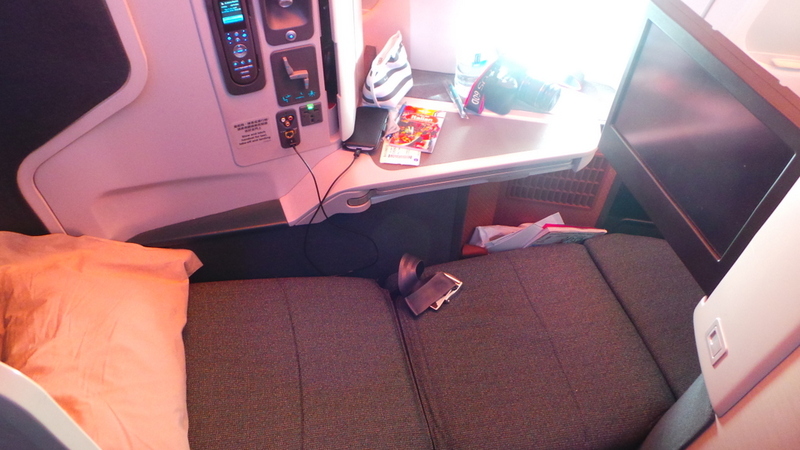 I was able to nap comfortably on the flight for a couple of hours. Only a couple because it was a daytime flight, and I was excited to watch movies! 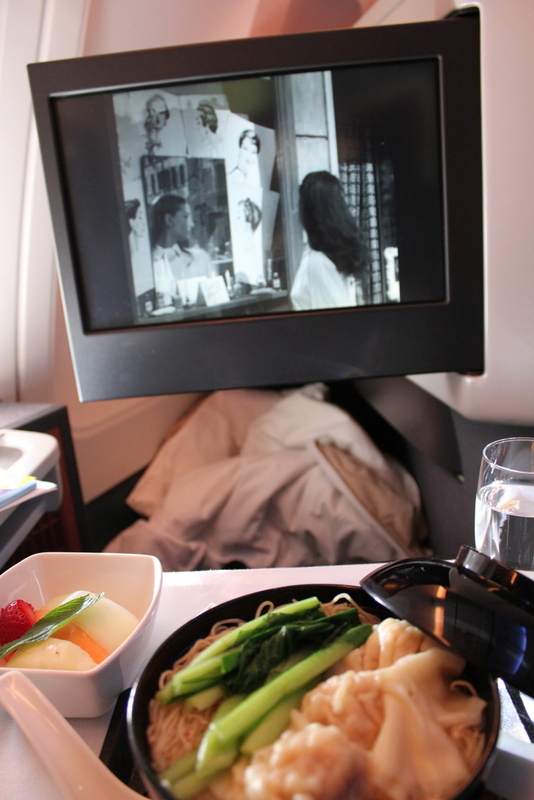 Cathay Pacific’s Studio CX offers a considerable (over a hundred) amount of movies, tv shows, and music. While I’ve seen movie selection that are greater in quantity, whoever chose the movies for Studio CX has extremely great taste. The collection contains classics such as Roman Holiday (which I watched for inspiration as I’m headed for Rome on this flight), Devil Wears Prada, and one of my favourite movies, The Talented Mr. Ripley. I also watched a couple episodes of Modern Family, which got me into fits of shaking laughter as always. Thank goodness for the well covered privacy walls on the seats! What I also liked is that there is a default classical music piping through the headphones when the system is switched off or on standby. The touchscreen TV measures 15.4 inches. There’s a choice of 4 main courses , including fish, meat/poultry, an Asian dish and a vegetarian option. And they have a very interesting way of presenting the dishes, which I really appreciated. 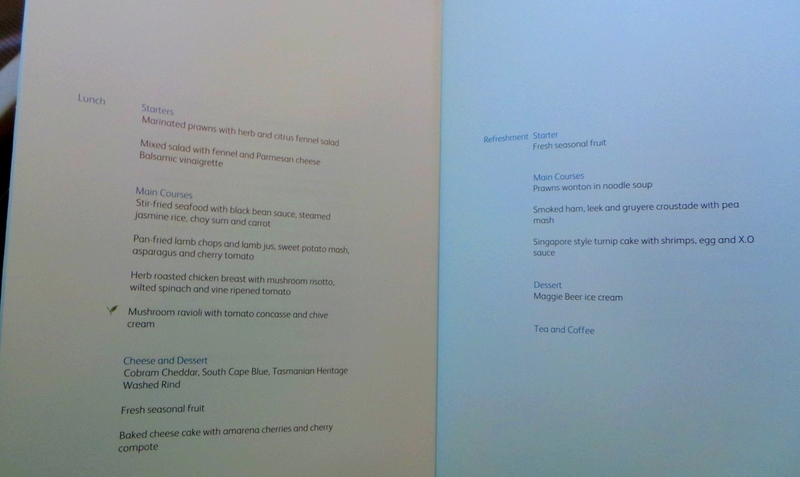 The cabin crew came up to me with all Four of the main entrees in the tray, and asked me to choose one. I liked this because sometimes, description of food based on words are different when it comes to the real dish. And it does help in making a decision when seeing what the actual food looked like in real life. 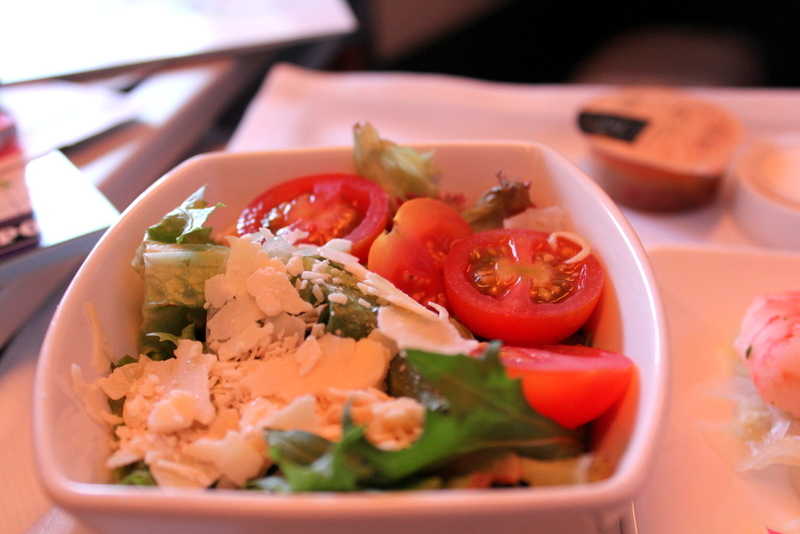 I can’t count the number of times on different flights, where I ordered something based on the menu, and when my dish arrives, and I look at the meal of the person sitting next to me (usually Zombie), I end up wishing I chose the other one instead. 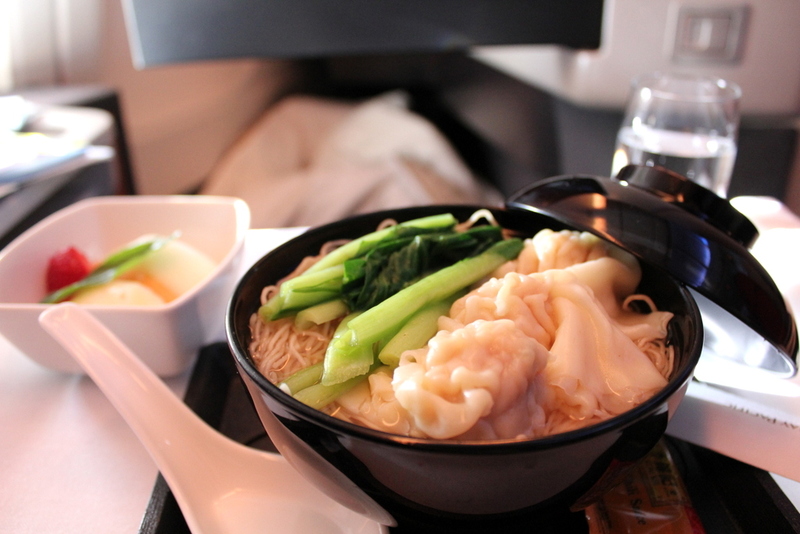 Cathay Pacific’s system of bringing all choices to each passenger is great and very passenger-centered, because it does involve a lot of to and fro-ing among cabin crew to be able to present all 4 dishes to all passengers. Seafood for Entree is always a good choice, especially if they are succulent prawns such as this! 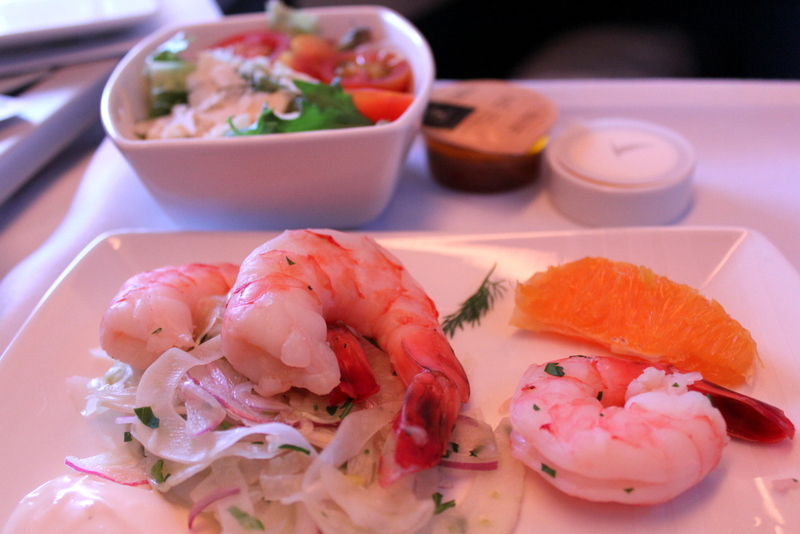 I ended up mixing the prawns with the citrus salad and the mixed salad, it was so refreshing! 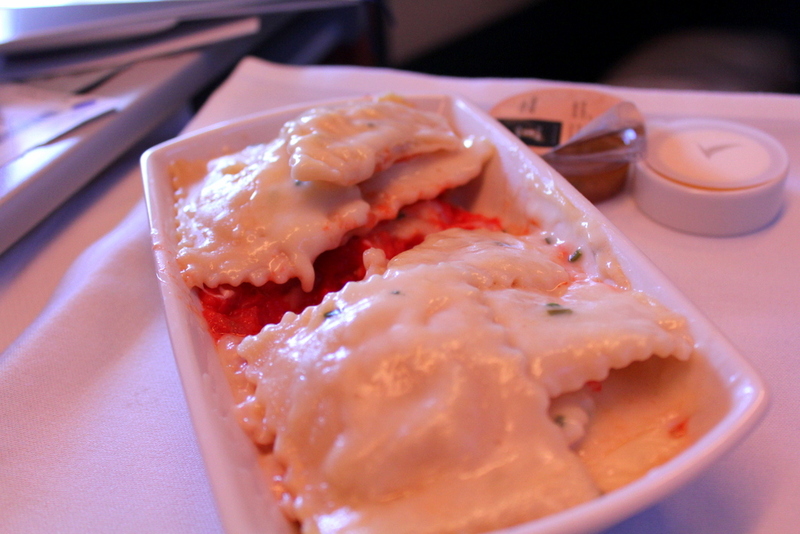 As for the main course, I chose the vegetarian ravioli. The mushroom in this ravioli were so finely ground. I can definitely taste it, but more chunks and texture would make it so much yummier. The chive cream sauce along with the earthy mushroom taste and tomato sauce gave it a bit of a “cultured” mac and cheese taste. Dessert was my favourite part because it came in twos. Cheesecake after a platter of cheese, how about that? One can never have too many cheeses (or baby cheeses! at that) in her life. 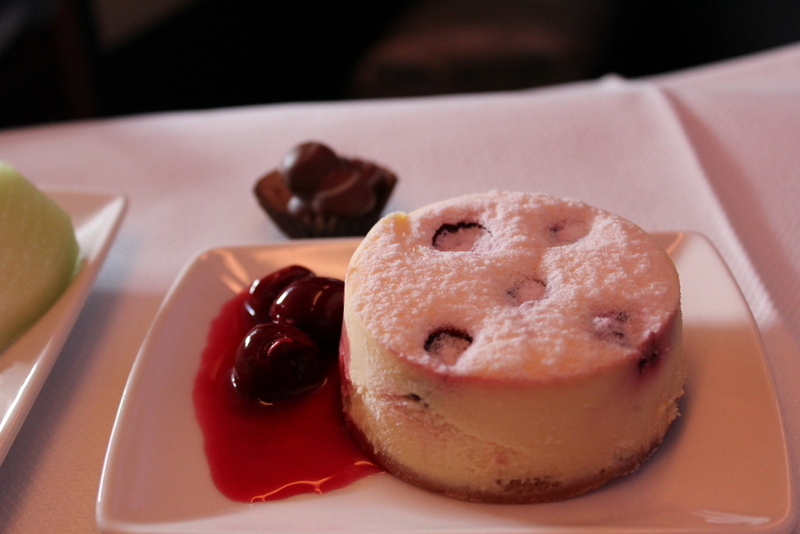 This cheesecake was really good – the right ratio of tartness and cream in the cheese filling, and the cherries not too strong. The crust was also a respectable amount of thickness and not crumbly at all. 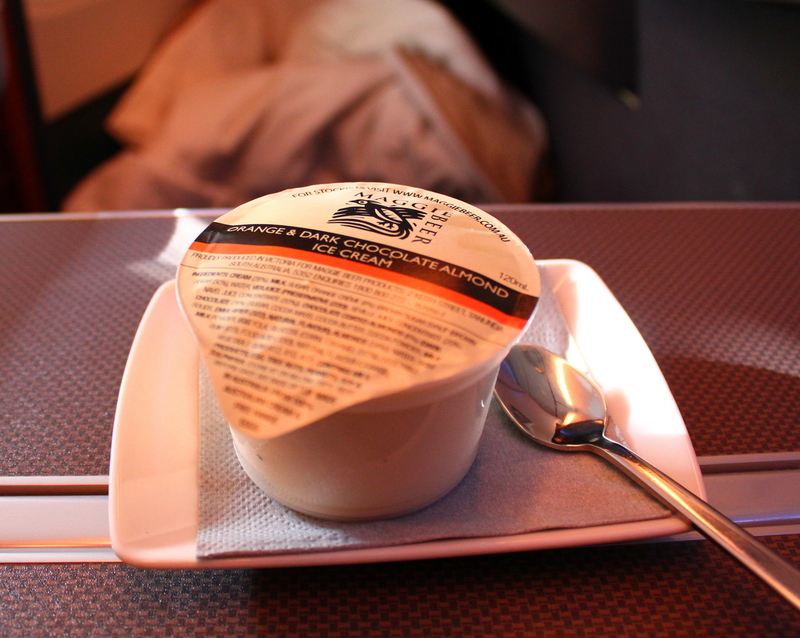 With the flight landing just before 1800 in Hong Kong, Cathay Pacific offered what was called a “Refreshment” as it’s second meal. Some may consider it as a late afternoon tea. I call it light dinner. Of course, this was the perfect accompaniment watching Roman Holiday. Here’s the part where Audrey (or Princess Anne) is getting ready to have her hair all chopped off by the Italian barber/hair stylist who was so smitten by her. Now this! If you love mint chocolate chip flavoured ice cream, be prepared to meet your new favourite. This is orange flavoured ice cream (smooth velvety orange), with a great sprinkling of almonds covered in dark chocolate -it’s frozen heaven in a cup. 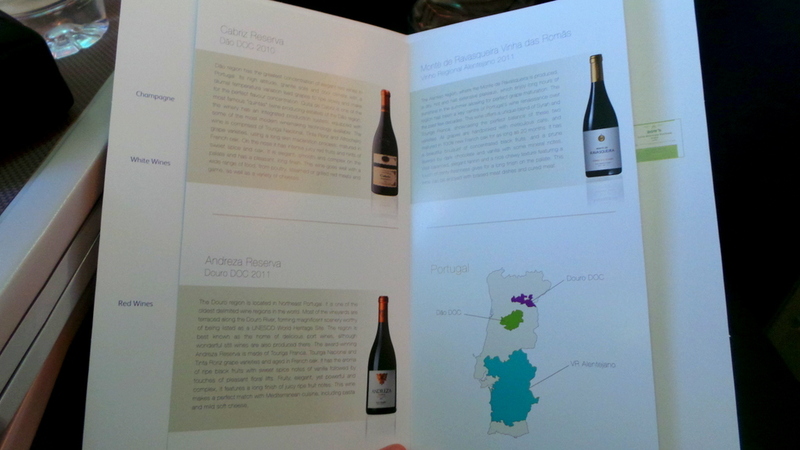 The flight attendant asked me curiously as she was serving aperitif. It made me wonder. I’ve never spoken to her, nor did I tell anyone on board where I was going. She must have seen the confusion on my face, then she gestured towards the working area/desk next to the control panel area. Of course, my tiny Italian phrasebook that I hastily grabbed from the airport before boarding. She was also very efficient in pushing their frequent flyer membership (Marco Polo). I soon was signed up for it, waiving the normal AUD 50.00 fee and also answered an involved flight survey. Service overall was very efficient, accommodating and friendly. 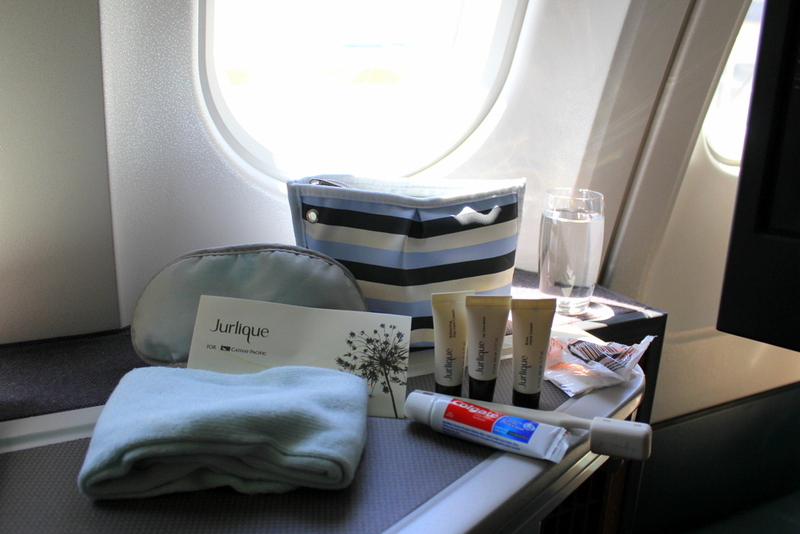 The amenity kit is made by French designer Agnes B. The bag itself is very useable after flight for other purposes. It contains: socks, toothbrush (not the disposable kind) and a decent sized Colgate toothpaste, an eyemask, 3 tubes of Jurlique (an Australian skin care brand) products – hand cream, lip balm and a day cream. I went a few times to use the lavatory, and they were very clean each time. 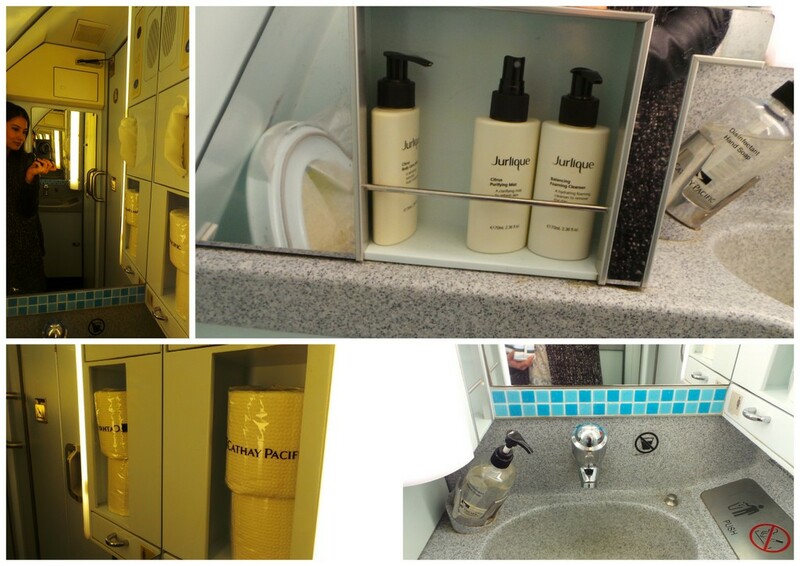 The lavatory toiletries are also from Jurlique, and I love that they included a facial wash! How thoughtful, especially for long haul flights. 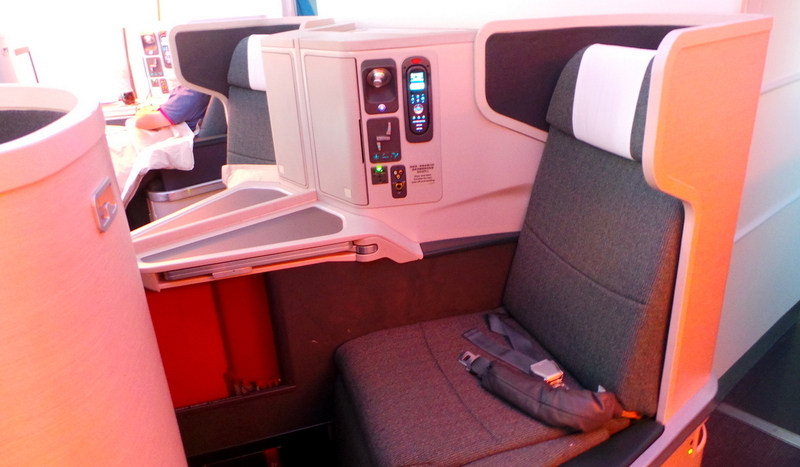 It’s overall an excellent business class experience for an almost 9-hour flight. The food was the biggest highlight for me as I really enjoyed not just the actual courses but the way food was presented and served. 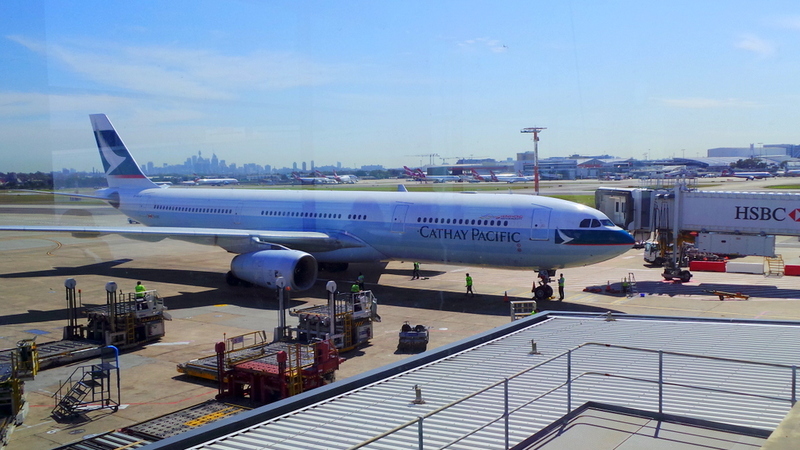 There are currently 26 Cathay Pacific flights weekly between Hong Kong and Sydney, but this will be increasing soon. I’m 6-4 and find the biz seats too short/too narrow at the shoulders. Since taller people are also higher income (on average) and more likely to buy a biz class seat, I sure would appreciate a longer/wider seat. Wish they’d get rid of the curved seat near the shoulders and lengthen the seat by another 6 inches. That said, CX has some of the best product in the sky – particularly the F seats that are nice and wide/long and even I can get some well-rested shut eye. This is my favorite business class configuration (except Singapore Airlines, of course, the best of the best), especially for window seats which look a bit like a first mini suite thanks to great privacy. 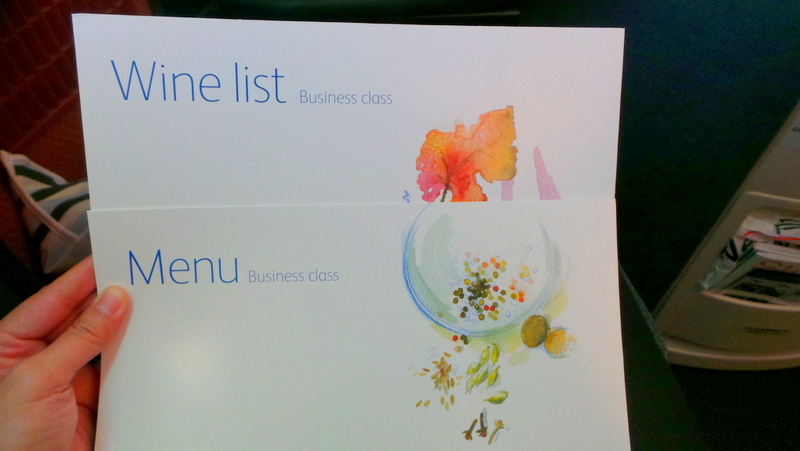 Added to the brilliant Cathay catering and crew service, it worth every dollar spent !! Hi Francois, I’d love to try the Singapore Airlines business class seats one day! 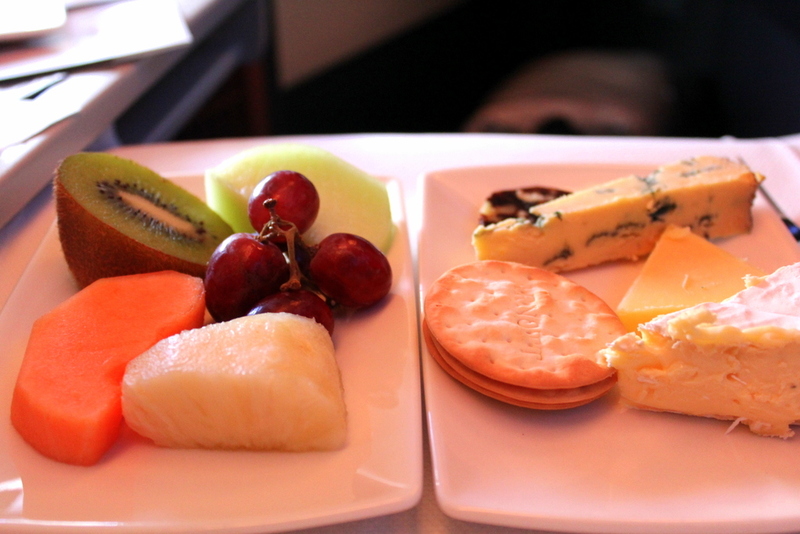 But yes the Cathay catering (especially the way they serve meals on Business Class) is so spot on. Will not hesitate to try them again next time! Thanks so much Kelly! Yes the movie selection was really great for October. 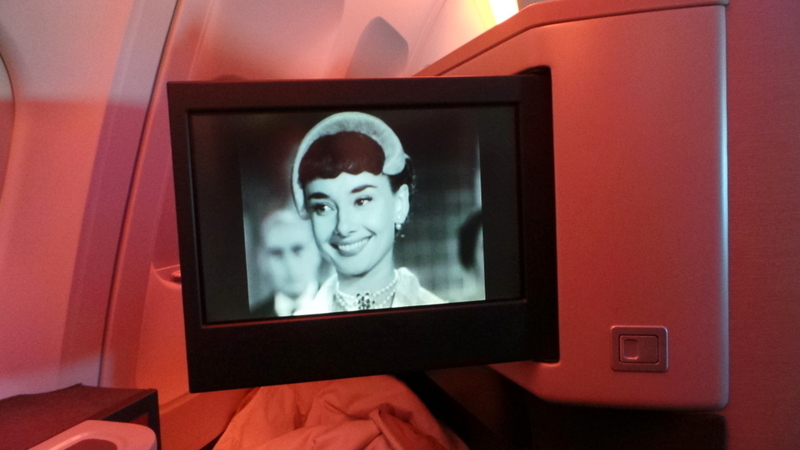 I just flew them from London to Sydney yesterday via Hong Kong and the movies were different (less classics). Oh I can imagine how wonderful the food would be at the Marco Polo lounge! The lounge at The Bridge at Hong Kong airport had really fresh dimsums.. yum 🙂 Rest of airline reviews on my Cathay Pacific journey to follow! Ahh memories of my recent trip with CP! I really liked how private the seats were. Good when you laugh too much or just want to hide away from everyone and sleep!